It's a glorious spring day here in the Lakes, unfortunately I'm waiting in to see if the ship discharging today will finish in time for this afternoons tide, or will go just after midnight, so a chance to do the cleaning, ironing etc that I keep putting off. Got over 30 miles in yesterday again, feeling better every time. 10.25 miles to work and then back again, and a lap of the town to warm up before out on my 8.5 mile circuit. I got my new cap light on, so I timed it to do the last half hour in darkness to see how it fared. As the nights get lighter we're going to have less opportunity to walk in the dark. It's good to get some experience of this, if you intend to finish for the first time, some of the walk will be in darkness so it's good if the experience is not a strange one. I have a new cap light this year, the normal type are all elasticated with a relatively bulky light at the front, but now I have a fisherman's light which makes it slim, with two clips to fix onto the visor of a baseball cap which makes it almost weightless. The only problem is that they are built cheaply from plastic, on the plus side they are inexpensive, on the downside they are flimsy and I don't know how long they'll last. It's getting more springlike outside at dusk here, I had to stop and pick a frog off the road at one point, a car was coming and I couldn't just leave it there. I was surrounded by bats just after dark although having short hair they won't get caught in it... or is that a myth from childhood? And there seemed to be a few insects flying around, although not too many to be annoying. Still, I'll be checking my first aid kit for insect bite cream and repellants today. I'm winding down for Sunday's race now, something I have to force myself to do. Still lots of stretching though to help repair any damage in the muscles from the last two weeks exhertions. I've a little time so I can explain what I can about stretching, and why it's important. If I use photo's or quotes, they are from a very useful book recommended to me by Dawne, my Island sports masseur, "The anatomy of Stretching" by Brad Walker. 1. Improved range of movement. By stretching the muscles we are increasing the muscle length, and therefore increasing the range of movement of the limb. By increasing the range of movement we increase the distance the limbs can move before damage occurs to the muscles and tendons. The more flexible and pliable the muscles of say, the leg, then the further the leg can move before strain or injury occurs. 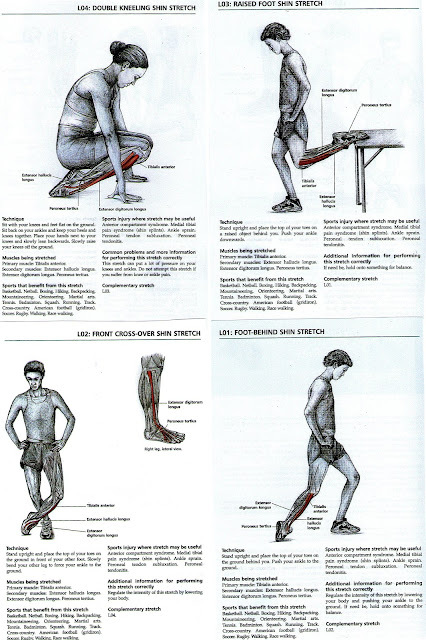 It used to be thought that if you stretched too much then you lost stability and muscle power. This has been proved to be untrue. By increasing the muscle length, you are increasing the range over which they are able to contract so giving strength throughout the increased muscle contraction. It also gives increased dynamic stability as the muscle is more in control throughout the extremes of it's contraction. 3. Reduced post exercise muscle soreness. We've all experienced the pain the day after a vigorous workout. This is post exercise muscle soreness, and is the result of micro tears, (minute tears in the muscle fibres) blood pooling around these micro tears and accumulated waste products such as lactic acid. Stretching, especially as part of a cool down, helps to alleviate this by lengthening the muscle fibres increasing blood circulation so allowing proteins to repair damage, and taking away waste products. Also, if stretching is done on a regular basis (Muscles cannot be stretched in one session...) the lengthened fibres and increased blood flow improve recovery, so on race day, after trudging up the Balleykillowey road, once it levels out, you can zoom off that little bit quicker as the muscles will clear themselves much more efficiently. There are two types of muscle in every movement, the agonists and the antagonists, The agonists are the working muscle, and the antagonist is the opposing muscle which returns the limb back to its starting position. Now, if the antagonists are not stretched, the agonists have to work harder. For example in a race walker, when the foot goes back, the toes push off. This is done by the calf (agonist) contracting and straightening the foot, giving a push off before leaving the ground. In this case the antagonist is the shin, and if the shin isn't stretched regularly, it restricts the push off as well as damaging the shin muscle. More energy is used to contract the calf muscle if the shin muscle is not as pliable, causing more fatigue. I found this out on my first Parish as my shins turned black afterwards with bruising and pain. Just by repeating these exercises you can increase flexibility in the lower leg, reduce fatigue, and increase walking speed. And, the lower two can be done anywhere, stood doing the dishes (men, or is that just me? ), waiting for a bus or standing in a checkout queue. I'll find some more important stretches for race walkers and put them in future blogs. Right, the phone's just rung, he's sailing at 11pm tonight, so I've got the rest of the afternoon off. I'm off for a walk. Thanks for pointing out my ommisson, Tonto. Stretching, and when to do it. Immediately before exercise, training or racing, 10 to 20 seconds on each muscle group can help in warming up the muscle, straighten fibres to increase blood flow and prevent injury by making the muscles and tendons ready for the upcoming stresses. This prior to, and in addition to other warm up exercises. Immediately after, 10 to 20 seconds after warming down will again straighten and stretch muscle fibres used during the training, which help blood flow so aid recovery by allowing proteins to damaged areas and washing away blood and lactic acids from exercise. One other thing, the damaged fibres I mentioned earlier are a good thing. These fibres are usually weak, and when they are damaged they repair stronger, over time, weak fibres are replaced by stronger fibres, hence stronger muscles. No pain no gain! Really Useful info Ric, are they before after or both.